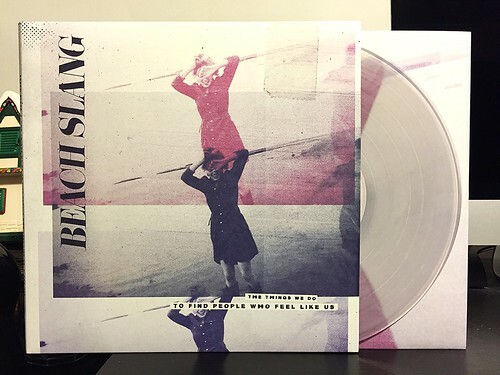 The Things We Do To Find People Who Feel Like Us is the first full length from Beach Slang, following up on two prior 7"s that I've also reviewed on this site. While they maintain a similar sound, there's something about The Things We Do... that gives it more impact and makes it feel like it's making a real statement. When I listen to the record, the statement I hear it making is that singer James Snyder is getting older and at times doesn't really know what to do with himself. He spends a lot of time singing about being young or conversely being older. I described James Snyder to a friend as a living, breathing Instagram filter. There are times where things come across a little over dramatic and perhaps borderlining on cheesy, but in general Synder's filter is one that highlights specific details and brings aspects of his stories into sharper focus. Musically, this is a band that's trying to channel the raw emotion of bands like The Replacements and to a lesser extent Jawbreaker. Snyder's prior band Weston dealt in the currency of upbeat catchy pop punk tunes. Beach Slang is much more somber in nature, but still manages to maintain the hooks that you'd come to expect from a guy who served time playing 90's pop punk. As I'm sure it's obvious to long time readers, I'm a total sucker for 90's pop punk, but Beach Slang blows away anything Weston ever did. As someone who is also getting older (today is my 39th birthday, actually) and who also doesn't always know exactly what to do with himself (let's face it, look at all these records I'm still buying), it is interesting to hear a record that seems pointed towards folks in my age group. While I may not love this record quite as much as a lot of other people seem to judging from the never ending stream of extremely positive reviews I've seen, I do think this is a pretty great record and absolutely one worth checking out.